"All companies that have sponsored the marathon of Jerusalem, including Adidas, will be boycotted," Saudi Prince Nawaf said at the end of meeting of the council in Jeddah. 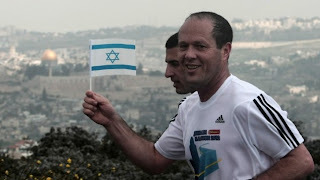 In fact, going beyond the boycott, Prince Nawaf said the council had also decided to organise a separate marathon next year in Arab cities entitled ‘Jerusalem is Ours’ to coincide with the annual Jerusalem event. "Israel is trying to misguide public opinion into believing that Jerusalem is its capital and that is a violation of all UN resolutions," Prince Nawaf said. Mr. Abdulla suggested that at this point the growing anti-Chinese sentiment was unlikely to damage China’s economic interests despite Arab leaders publicly criticizing China as well as Russia for their vetoes of anti-Syrian resolutions in the United Nations Security Council. While that appears largely to be the case for the Gulf’s autocratic oil producers, China’s most important counterparts in the Middle East, that may not be the same for those nations such as oil producing Libya that have toppled their autocrats. At the same time, China attempted to straddle the fence by cultivating relations with both Mr. Qaddafi’s embattled regime and the rebels. That even-handed approach however didn’t prevent the rebels from threatening a commercial boycott, particularly after they found documents purporting to show that Chinese defence companies had discussed the supply of arms with Qaddafi operatives. A Chinese Ministry of Commerce delegation visiting Libya in February failed to secure agreement on recovering at least some of the losses that China, Libya’s biggest foreign contractor, suffered with the evacuation last year of 35,000 Chinese workers who were servicing $18.8 billion worth of contracts. Soccer, like baseball, basketball, football, volleyball, tennis, cricket, golf, billiards, marbles, etc... is just another ball game! I played very little soccer. But I did play baseball in elementary school. Tried basketball when I was older, but was too short. Enjoyed sandlot football when I was a child. Was never much on volleyball, cricket or marbles, although I enjoy marbles as works of art! I learned tennis, but don't have the legs for it now. I still play pool and golf, so I guess we all may hold onto our ball games of choice, even when age and inclination lead us to put away some diversions we entertained as children. Tim, thanks for the comment. Indeed one does although soccer never was my game and often is far more than a game which is the essence of my blog. Best.